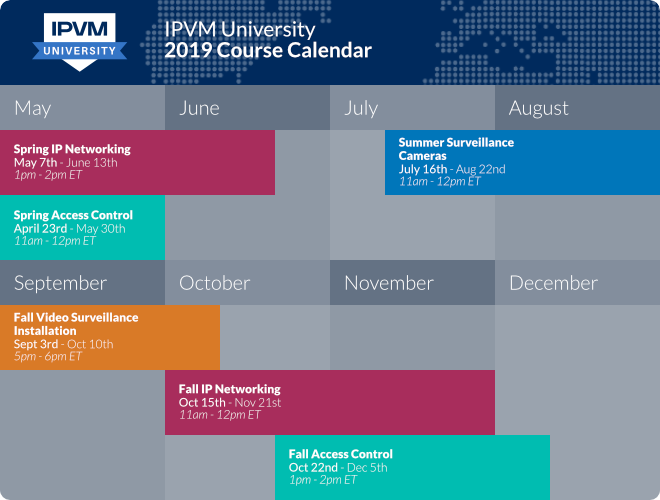 IPVM offers live online courses where we teach video surveillance and access control based on our unique ongoing researching and testing. You can take the courses from anywhere in the world, attending live or watching the recordings on demand. We include weekly quizzes, a final exam, extensive personal feedback and certifications for those who pass. The Spring Access Control Course will start on April 23rd, 2019. The class meets 12 times over 6 weeks (Tuesday and Thursday) for 1 hour from 11am to 12pm ET. The Spring IP Networking Course will start on May 7th, 2019. The class meets 12 times over 6 weeks (Tuesday and Thursday) at 1pm - 2pm ET. The Summer Camera Course will start on July 16th, 2019. The class meets 12 times over 6 weeks (Tuesday and Thursday) for 1 hour from 11am - 12pm ET. The Fall Video Surveillance Installation Course will start on September 3rd, 2019. The Fall IP Networking Course will start on October 15th, 2019. The class meets 12 times over 6 weeks (Tuesday and Thursday) at 11am - 12pm ET. The Fall Access Control Course will start on October 22nd, 2019. The class meets 12 times over 6 weeks (Tuesday and Thursday) from 1pm to 2pm ET. Live Classes: Each course meets twice a week for ~6 weeks. We meet using webcasting software and live chat, presenting demonstrations, graphics and explanations. We answer dozens of questions every class that helps you get the most out of each class. In IPVM classes, you are able and encouraged to interact to get the most out of it. Course Readings: Each course includes ~300 pages of readings. These readings are based on our ongoing research and testing of security products to ensure that you learn what is current, which is critical given the ongoing changes in technology.